1. Touch the VSee icon until an "x" appears on it and it begins to shake. 2. 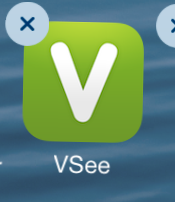 Touch the "x" on the VSee icon. A prompt will appear to tell you that all the data will be deleted, but just confirm Delete. 3. Click your home button to return the other icons to normal. 4. Follow the instructions in the support article, Install VSee: iPhones to reinstall VSee.